The Blackhawk women's CCW tech hoody gives you the ability to draw your concealed weapon quickly without giving away your position. Thanks to a clever handgun access point in the hoody's hand-warmer pocket, your belt-mounted holster is within easy reach. It also includes a hidden pocket on the front pouch pocket for storage. 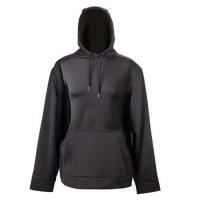 Blackhawk designed the CCW black hoody for women with comfort and warmth in mind. It is made from warm, high-quality polyester and cotton fleece with drop-shoulder seams ease of movement. The drawstring-adjustable hood protects your head and ears from the wind. It's the perfect jacket for women who need their weapon locked down but demand comfort.